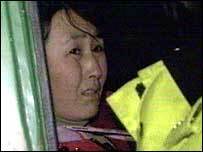 Three people have been convicted in connection with the deaths of 21 cocklers in Morecambe Bay in February 2004. The trial uncovered a complex web of illegal immigration, gangmasters and unscrupulous businessmen. Bad weather and high tide warnings kept most cockle pickers away from Lancashire's Morecambe Bay on 5 February last year. But gangmaster Lin Liang Ren, 29, was undeterred. He took about 30 Chinese cocklers, all illegal immigrants, out to work in the Warton Sands area with no regard for their safety. Most of the Chinese were from farming backgrounds and, as prosecutor Tim Holroyde QC pointed out, "some had never even seen the sea until they first went cockle picking". Twenty-three of the group never returned. They died as the tide rushed in - first stranding them, then washing them away. One of the group made a desperate 999 call at 2130 GMT - his broken English only allowing him to utter "sinking water" before being cut off. Mr Holroyde summed up their hopeless plight: "Far from home and unable to speak sufficient English to summon help, in the cold and dark, with no obvious route back to shore even if they could swim, and with the water rising swiftly and inexorably." A massive rescue operation was launched to try to save the cocklers, but most were dead before the lifeboats arrived. RNLI commander Harry Roberts labelled it the worst tragedy he had ever seen. He and his colleagues had the grim task of pulling bodies of the dead from the sea. "They didn't have any safety gear and some of them were naked because they had taken their clothes off to help them swim," Mr Roberts said at the time. Some 10 Chinese workers survived and were taken to a local police station, where they were met by Lin Liang Ren and his 21-year-old girlfriend, Zhao Xiao Qing. Lin told the survivors to pretend two of their dead co-workers were the bosses, but some refused and testified against the pair in court. One of the survivors, Lin Guo, told the jury how he and his family had been threatened. Giving evidence from behind a screen, he said: "Someone went to my house and beat my dad, telling him I shouldn't go and act as a witness otherwise they would pay money for my head." The cocklers lived in cramped conditions in houses shared with up to 30 others in Liverpool and Morecambe. Liverpool-based Lin Liang Ren rented a house in that city where most of those working on the sands that day had lived. Lin's cousin, Lin Mu Yong, 31, rented a house in Morecambe which he told the landlord would house six to eight workers. When the landlord's agent paid a visit, he found 30 mattresses and no other furniture. Lin Liang Ren, who never collected cockles himself, sold the produce for £20 a bag - paying the cocklers £8. All but one of the cocklers were from Fujian province in China and paid thousands of pounds for their passage to England. Fujian people are known for leaving their homes in search of work, but emigration is ruthlessly controlled by gangsters known as Snakeheads whose fees cripple those who pay. 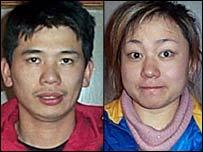 Guo Binglong's family borrowed £20,000 from loan sharks to pay the Snakeheads. Their combined yearly income is just £1,000. He made a final phone call to his family as the tide swirled around his chest. He told them: "The water is very dangerous. I'm going to die."